Sometimes, even the most unassuming creatures are capable of wreaking massive amounts of havoc. 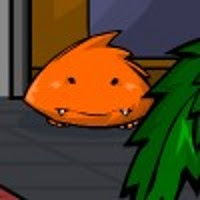 Foreign Creature – Prologue: The Unforgotten Mistake, a new adventure from developer Belugerin Games, puts you in the shoes of a small and furry, orange “creature,” with a penchant for killing anyone or anything that stands in its path. Most of your actions in the game involve creatively murdering your way to victory by using your alien powers in strange and disturbing ways. Much like Zeebarf’s “The Visitor,” the game is a point-and-click adventure, comprised of more than half a dozen “levels,” punctuated by a few cut-scenes. The most striking aspect of Foreign Creature is its presentation. The art and environments are all top-notch, and the cartoony style does a great job at drawing you into the world. The violence and gore, while gratuitous, manage to be shocking without feeling out of place. On the downside, there’s only one path to victory. The story is a fun ride, but doesn’t always flow logically from one scene to the next. Despite the linearity, some of the puzzles aren’t very intuitive, and a few even require clicking on specific areas in succession to move things forward. The “Walkthrough” button in the upper-left corner of the screen is telling. Foreign Creature – Prologue: The Unforgotten Mistake, is a pretty good adventure game that’s made even better by some tremendous production values. If you’ve got the stomach for some cartoony blood and guts, and aren’t deterred by a confusing puzzle or two, it’s definitely worth some of your time.